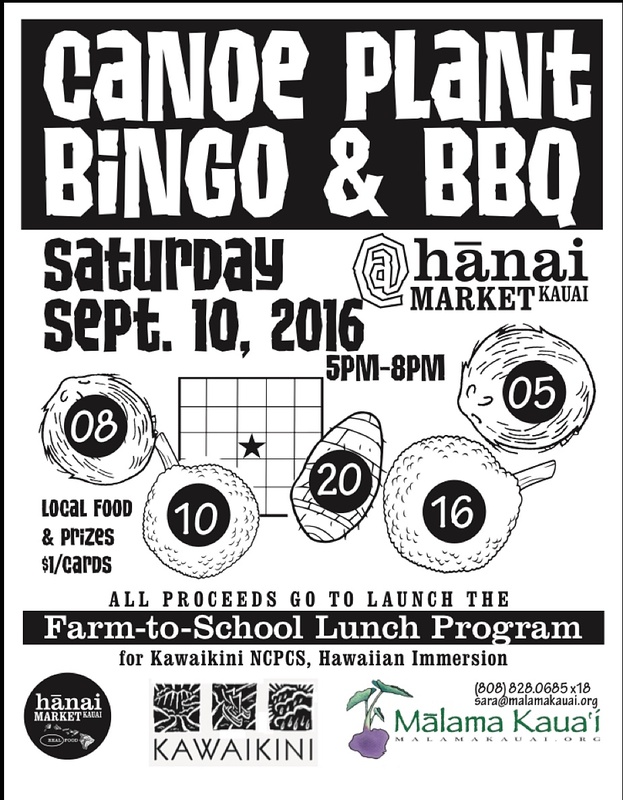 SUBHEAD:Benefit for the Farm-To-School Lunch Program at Kawaikini Public Charter School. Image above: Classroom with students and teacher at Kawakini School. From (). At Hanai Market, at the old Kojima Store location in downtown Kapaa on Kuhio Highway. Or donate online at www.malamakauai.org. Sara Hopps, at sara@malamakauai.org or telephone 828-0685 x18. Image above: Poster for Bingo event. Click to enlarge for printing. From Malama Kauai. Bingo cards are only $1 Donation, and participants can win prizes such as gift certificates, jewelry, activity passes and more from local businesses including Kaua’i Beer Company, Hawaii Reef Guides, Olympic Cafe, Oasis, Studio Barre & Soul, Marriott Resort and Aloha Aina Juice Cafe and much more. Locally sourced food will be prepared by Hanai’s culinary team, including Chef Adam Watten. Since losing its school food vendor when Lanakila Kitchen closed in 2015, Kawaikini has had no consistent lunch program to provide its students. This also means that students cannot use their reimbursements for free or reduced lunch through the National School Lunch Program, causing hardship for some families. Last school year there was an interim lunch program, where the students were provided low-cost meals twice per week, which included donated produce from Malama Kauai, Moloaa Organicaa, and other farms. Meals were prepared by Aunty Lorna Poe, who has three grandchildren at the school. Students are also provided fresh fruits and vegetables for snacks through the Village Harvest gleaning program. “We are actively seeking a new food program vendor,” says Samuel Ka’auwai, Principal at Kawaikini NCPCS . “Because of the low reimbursement rate and smaller budget we have, it’s been difficult to find a vendor willing to provide meals three days a week when they know they won’t make a large profit.